It’s hard to escape the children’s toy lesson without addressing the prevalence of Apps for Smart phones and tablets as the new toys for toddlers. Give it just a couple of years and this lesson will be obsolete as the students you’ll be teaching grew up playing more with Apps than physical toys and they will have no idea why that may be a problem. Regardless of your bias, we need to teach tomorrow’s child care workers & parents how to evaluate Apps that are good for children from the ones that are fluff. 4.2.3 Analyze cultural and environmental influences when assessing children’s development. 4.3 Demonstrate integration of curriculum and instruction to meet children’s developmental needs and interests. Show the YouTube video below of a baby trying to read a magazine like an iPad. Funny or sad?? Have a mini class debate on whether toddlers should be exposed or encouraged to use smart phones and tablets at such a young age. Divide students in half and have one side list all the reasons toddlers should be encouraged to use Apps and the other side list all the reasons toddlers shouldn’t be allowed to use Apps at such a young age. Then have each side make their points and counter arguments. 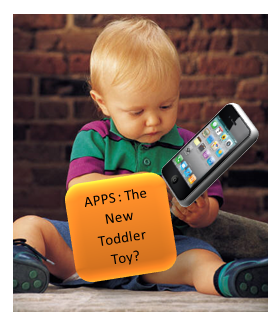 The goal of this activity is to have students find three age appropriate Apps for toddlers (ages 1-3) and analyze them. They are to defend why each app is age appropriate and what the child learns by playing with the App. This activity should take maybe half a block. After students are done have each student present his/her favorite App to the class. It is best if students actually download the Apps on their phones and play with them, however this may not work for some schools and some students who don’t have smart phones. For Android Apps, as an alternative, you can go to Google Play and preview Apps and watch videos of some of the Apps there. For homework have students write a one page paper defending their position on letting their own child(ren) use Smart phone Apps when they are toddlers. Just wanted to let you know that I tried the toddlers & technology lesson out with my child development classes earlier this week. I got permission to for my students who had the right kinds of phones to use them and I supplied iPads to those that didn't. What an engaging lesson…..my students really got into this activity and had alot of fun doing something educational! The prompt writing was very enlightning as well as students really thought through and defended their responses. I wish there was more of these types of activities/lessons available for various FACS content, but personally I know I don't have time to explore everything so I just wanted to say "thank you" for having to time to figure this lesson out and share it. I'll definately be using it again next year! I am glad that you have taken the effort and time to share this shocking and yet facts about the future of the younger generation with technology. All I can say is that this will happen and is already happening and parents have a greater responsibility for the kids.